Reliable Sources: Unprecedented; diversity; deception; nix on neutrality. Zurawik: Trump’s ‘war on press’ is no match for Barack Obama’s. Report: Heather Naurt hired as State Department Spokeswoman. MSNBC signs Mark Halperin as analyst. Tom Shillue makes book. CNN hires another impartial reporter…Valerie Jarrett’s daughter! Kaylee Hartung jumps from ESPN to CNN. Sunday talkers: preview. Flood: How Maddow doubled her ratings; has FBN dethroned CNBC? Reliable Sources: Trump supporters; balance; Trump’s claim is ‘unpatriotic’. says her goodbyes to Red Eye and Fox News. Beeley: Was CNN’s Clarissa Ward embedded with Al Qaeda in Syria? Sean Hannity in a twitter spat. CNN overhauls its ‘native’ advertising. Greta: Get the potato out of your ear! Fox News weekend special: Zika. Marcus: Meet Fredericka Whitfield, triathlete. Sunday talkers: preview. Thursday’s numbers: Sean Hannity-Rachel Maddow-O’Donnell 1-2-3. Red Eye fans react as Joanne Nosuchinsky reveals she’s leaving Fox News. CNN’s ‘new normal’: another day, another two expletives dropped. More. Buckman: Fox News is ‘a great tv network‘. Two FNC embeds promoted. Joyella: Will Megyn Kelly’s upcoming memoir address issues about Ailes? Farhi: Why is liberal feminist hero Susan Estrich representing Roger Ailes? on controversy over Melania’s immigration. CNN, terrorism, and The Way of the Serengeti. Craig Melvin moonlighting. Tuesday’s numbers: DNC/CNN – Coop – DNC/MSNBC 1-2-3. Chris Wallace meets Hillary. Orlando Salinas resurfaces…in handcuffs! A liberal pundit reveals ‘the truth’ about his appearances on Fox News. Interrupting MSNBC reporter bellyaches that Trump told her ‘be quiet’. Hate facts: Bill O’Reilly’s WH history lesson sparks social media outrage! Zucker play: CNN reveals the true victims of the ISIS Catholic church raid. Q&A: Dana Bash on politics, parenting (via TVN). Audio Q&A: Steve Kornacki. Erik Wemple perturbed that Rupert Murdoch thanked his staff for ratings win. Freaky Friday numbers: Jake Tapper-Bill O’Reilly-Don Lemon 1-2-3. Boycotters’ dilemma: Megyn Kelly lands Big Fox interview with Trump. Q&A: Greta discusses reporting from Ecuador using Facebook Live. on FBI leaks in Clinton probe. Somerby: Maddow spins trivial 2001 flub to make viewers hate Kasich. Umstead: With Al-Jazeera America gone, emerging nets fill the void. The Cable Game: He cried sexism, but let it skate when it struck Kate. Good: Andy Levy knows his Division nerfs from his super-geared Rogues. Hogue: Steve and Brian in, Clayton absent sans explanation. Sound fishy? ICN: Zucker’s in it for the ratings; Wemple: Repetition doesn’t equal depth. Jasper: Zucker insists he’s not dumbing CNN down, says Vice is ‘overrated’. Monday town halls: Dem candidates to be grilled…by Maddow and Hayes. Wednesday’s numbers: O’Reilly-Sean Hannity-Sandra Smith 1-2-3. Katz: Why more viewers are getting bullish on Fox Business Network. Somerby: What ‘huge national news‘ took up 2/3 of Maddow’s show? Kiernan Forbes, aka AKA, says CNN coverage of terrorism is selective. Wemple: After trouncing O’Reilly, Jorge Ramos did the same to Hannity. Hannity has biggest night of the year. Reisman: Shep Smith dings Trump. Wemple: CNN stands behind its much-maligned, lying countdown clocks. tell how to keep USA safe from terror attacks. Monday’s numbers: Bill O’Reilly-Megyn Kelly-Sean Hannity 1-2-3. Top ten reasons to fire Harris-Perry. Farhi: Is MSNBC now too white? Joyella: Super Tuesday coverage rundown. FBN hits ratings high in Feb.
February numbers: Fox News breaks 13-year record; CNN; MSNBC. Flood: Debates, town halls give CNN Feb demo; FNC wins total viewers. Did MSNBC cancel an interview over a mention of Melissa Harris-Perry? CNN snags Mary Katherine Ham. CNN to simulcast another Dem debate. Trump rips Fox…while on Fox! NY Times revives the Wayne Simmons story. on Trump and David Duke. Tuesday’s numbers: SotU (CNN)-SotU (FNC)-SotU (MS) 1-2-3.
Who wants to buy AJAm’s channel space? One America News. Current no longer: Al-Jazeera America is shutting down. More. Concha: AJAm doomed by its toxic brand name, lack of opinion. Zurawik: The Best and Worst Presidential debate moderators. The Daily Show extended video: Greg Gutfeld. Neil Cavuto re-ups. Concha: Impartial NBC reporter credits nuke deal for sailors’ release. Finding Your Roots video: Bill O’Reilly, plus Soledad and Bill Maher. Monday’s numbers (demo): Bill O’Reilly-Bret Baier-The Five 1-2-3. Bill O’Reilly’s very good week. MSNBCNN adopt Microsoft Pulse tech. Q&A: Sandra Smith, Trish Regan; Neil Cavuto. Today’s criteria complaint. Hod: Bartiromo horrified at El Chapo interview. Q&A: Trish Regan; more. Hype machine cranks up for CNN’s New Year’s Eve ‘dream team’. 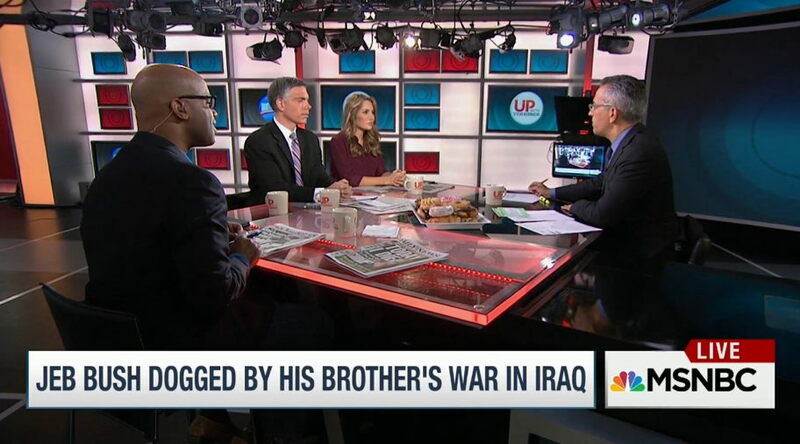 Wemple: Explosive accusations in Al-Jazeera ‘doping’ documentary. Chariton: Five to watch. MSNBC host calls for Rahm Emanuel to resign. Friday’s numbers: Doug McKelway-The Five-Bill O’Reilly 1-2-3. Gutfeld show moves to Saturdays. Ailes’s plan to make FBN a success. Zurawik: CNN deletes phrase about Freddie Gray’s mother. Apology? Fox News Sunday hits ten-year ratings peak. Geraldo threatens lawsuit. on the media’s rhetorical blame game. Hillary aide called MSNBC ‘heinous’. Bloomberg’s Phil Mattingly to CNN. Metal rocker GWAR performs ‘ritualistic decapitation‘ of Fox News reporter. FTV: CNN goes to Iran…to talk about Trump! Video: This is CNN. Bevan: Chris Wallace is the new dean of the Sunday shows; Q&A. Upset: FBN tops MSNBC 11am for fifth time. Deirdre Bolton talks Fed. Wemple: Did CNN compromise standards for access to the Clintons? Wemple: CNN’s Trump apologist more dangerous than Trump himself. Wemple: Masses overrule elites; Axelrod rejects MSNBC partisanship. to claim Obama’s a Muslim. John Kasich, Wednesday’s forgotten man? Walker: CNN had an agenda. Escalante: Will MSNBC cut Díaz-Balart as anti-Latino sentiment brews? Reliable Sources: Trump vs Fox, the right vs Fox, how to question Trump. Sorry trip truthers, Megyn Kelly’s vacation went just as scheduled. Is this the stupidest Megyn Kelly hit-piece ever? TCG: Who said it? Sharon Stone Post cover too hot for morning tv? Q&A: Kate Bolduan. A little too much synergy in Red Eye, Kennedy, Gutfeld Show bookings? Zurawik: Victor Blackwell’s coverage of Baltimore does CNN proud. Greta apologizes to Chris Christie over ‘hug’. Sunday talkers: preview. wonders if Google could ‘steal’ an election.